Well this is the last day of June and the first six months of 2012 is coming to a close. This gives me an opportunity to compare the Dublin Real Estate Market this year versus last. The market has been very active so far this year and housing inventory has been tight which could certainly be reflected in the results. 172 Single Family Homes sold in 2011 versus 166 is 2012. The median sales price in 2011 was $641,000 versus $575,000 for this year. More activity in the lower end of the market may have played a part in the decline. Attached Homes have also seen fewer closings this year with 134 sales versus 159 in 2011. The median sales price is almost identical at $330,000 in 2011 versus $320,000 in 2012. The time it takes to get a home into escrow has dropped dramatically for both market segments. Remember all real estate is local and feel free to contact me with questions on how your individual neighborhood has fared. Have a Safe and Happy 4th of July Holiday! 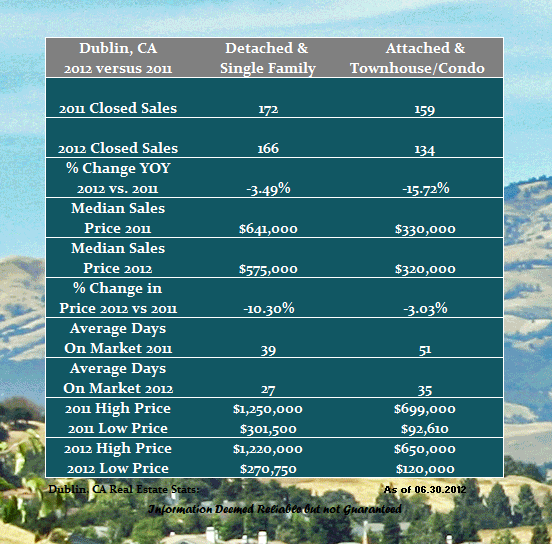 Share the post "Dublin Real Estate Review thru June"